Fort Qaitbey (also known as Citadel of Qait Bey or Qaitbay) is a fortress along the Mediterranean coast in Alexandria, located on the ruins of the famous Pharos lighthouse. Fort Qaitbey was built starting from 1480 under the Mameluke Sultan Al-Ashraf Qaitbay for the purpose of fortifying the coast against the Ottoman Turks. Fort Qaitbey consists of a set of external walls which surround an inner court and a castle-like structure. 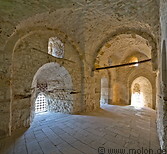 The interior of the fort has some impressive architecture and offers good views of Alexandria and the sea.